Family vacations have never been relaxing for me; however, I’ve been doing far less for my family these days. I’m hoping they’ll appreciate spending time with me, and I’ll try really hard to not listen to my iPod unless they’re doing something else. I plan to bring my old, classical guitar along so I can play a little in the middle of the night! I won’t be writing while I’m gone, but I’m sure I’ll look forward to sharing something when I return. Next weekend, I have two performances at Border’s, so life will be busy. I’m also meeting my high school music teacher for lunch on Saturday, and that is quite exciting for me. The last time I saw her, I was not a singer! (I still don’t consider myself a singer, by the way.) My teacher, Frankie, was very supportive last December when my mother was ill on a respirator. 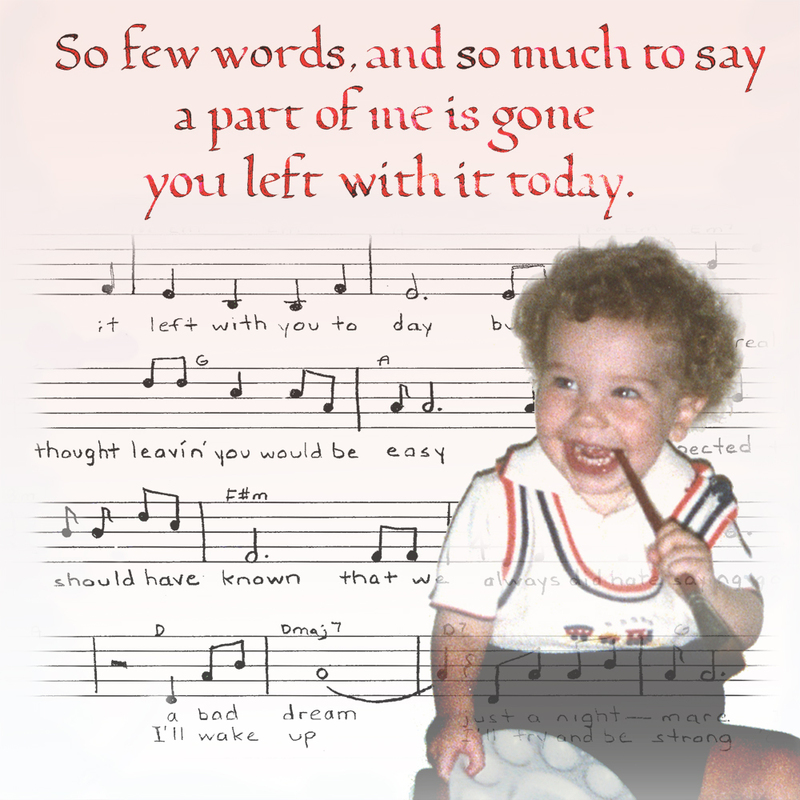 I also named this post, “Saying Goodbye” for my song with that name. I began writing songs when I was sixteen-years-old. The emotions in my life were channeled into each and every song, as well as projections of love and loss I hadn’t yet experienced. I made a conscious effort to make every song of mine different. I know I have mentioned more than a few times that my songs are like “babies” for me. There was definitely a “birthing” process for every song I’ve written. “Saying Goodbye” was written when I was nineteen. Originally, it was a break-up song. I decided to break up with Michael because he was always unhappy that I wanted to date a lot of other guys. Imagine that! He pouted a lot, especially when I told him I wanted to date other people. I finally decided he was so unhappy with me; that it was best we stop seeing each other since I was so immature. I’ve mentioned I was fickle, and I did miss him. Therefore, I wrote him a song. The story goes that I ran into him six months after that, and I decided we could get back together. A year later we were married. This year, we will have been married thirty years. This song always felt very meaningful for me. It had a strong, strumming beat that ended with a musical crescendo. I could sing out loudly and passionately on this song! 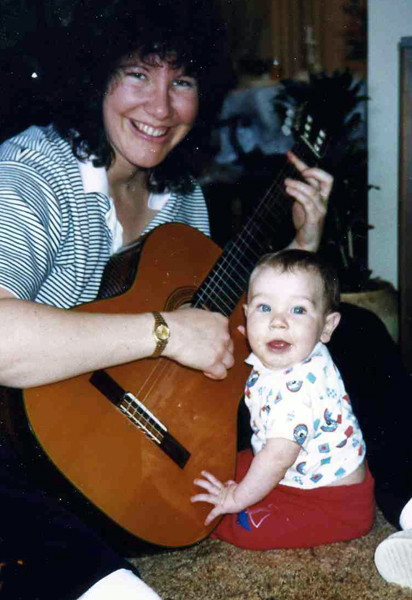 After my five-year-old son, Jason, died in 1992, singing was not joyful for me at all. However, I derived comfort by playing certain songs at his gravesite and performing them in situations such as the holiday gathering of the Compassionate Friends. 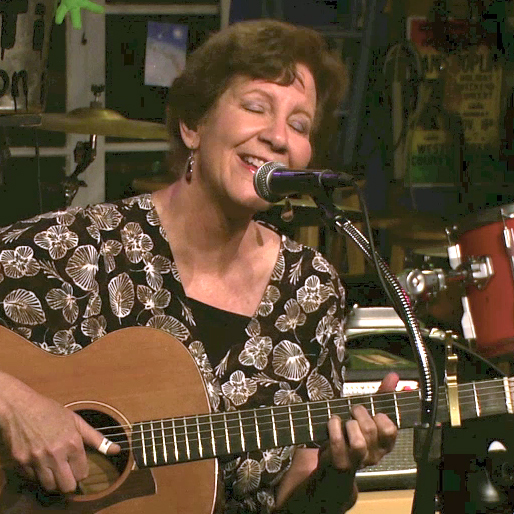 For thirty years, I played the same song for my children – Puff the Magic Dragon. In this picture, I’m with Jason and he loved my guitar playing. Currently, my 13-year-old son enjoys singing also. I changed the lyrics to three of my songs. 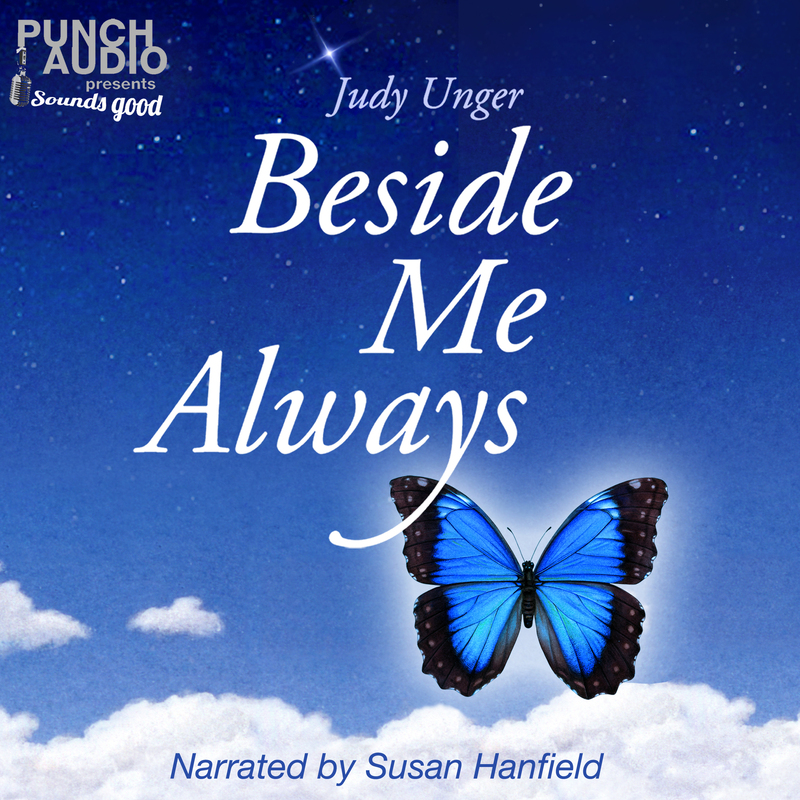 The songs were: Beside Me Always, More Than You Know, and Saying Goodbye. As I have been in the process of “rediscovering” my songs, I have wondered which version of “Saying Goodbye” I would record. Late last night, I was busy typing out the chords for my arranger, George, as well as for myself – since I use a capo on my guitar to play in a comfortable key. 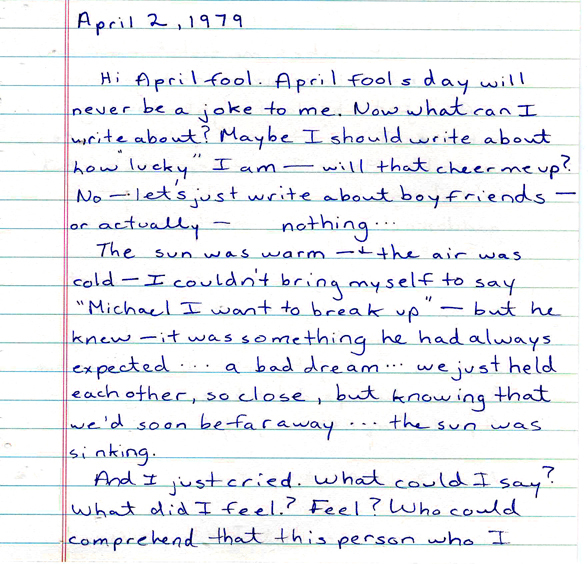 I typed out both versions – the break-up one, as well as the one about loss. 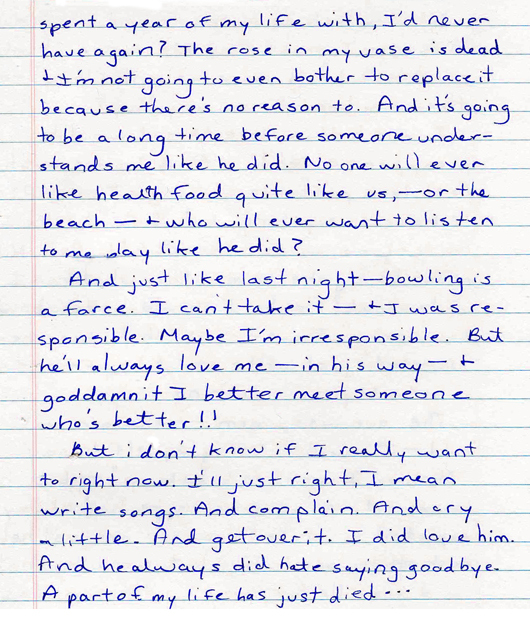 The one about loss could also be about a break-up, and felt much truer for me. However, I was aware this song was far less “unique” if I chose to make it another song about loss. I have quite a few of those! The lyrics have a lot of similarity. I mention “the flowers have all died” – Michael used to always bring me flowers while we were dating. 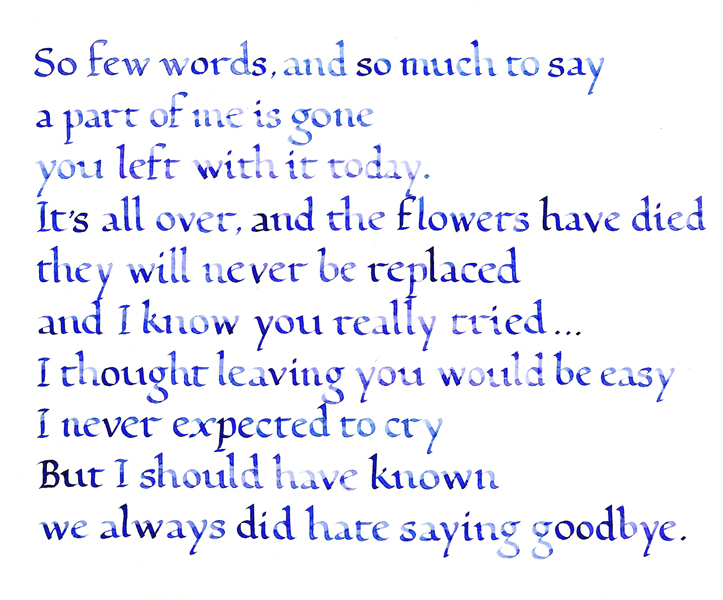 In the revised version, the flowers refer to the ones that died after the funeral. I looked toward him and said, “Did some celebrity die that I should know about?” I was actually puzzled! I guess if I ever write a new song, I’ll have to come up with some other subjects! I thought perhaps I would do two sets of vocals, however, there was only time for me to record one version of my song. I sang over and over for George, until tears were oozing out of my eyes. It was hard work trying to get the feeling into my voice. It wasn’t that I didn’t feel it; I just didn’t hear it in my voice. It was also exhausting working with George on this song’s arrangement today. I am not that rhythmic, but my guitar playing has improved significantly since I started playing again this past January (after thirty years). Goodbye, goodbye my love, goodbye . . . 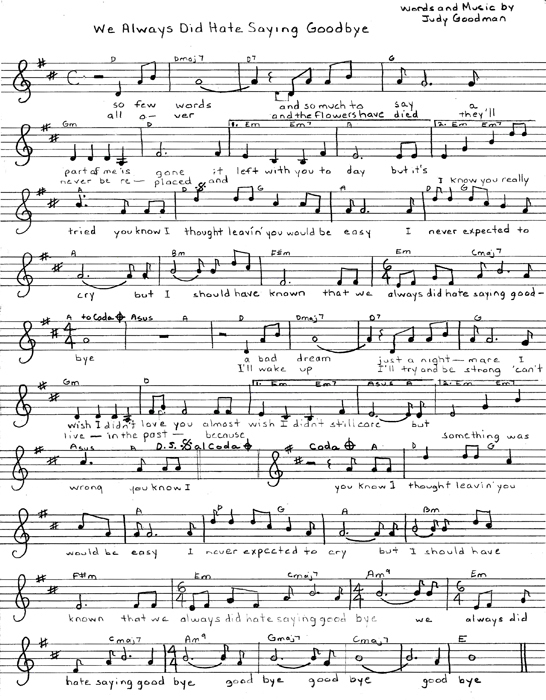 This entry was posted in Uncategorized and tagged acoustic guitar, break up song, breaking up, breakup song, breakups, child's death, composing, creativity, grief bereavement "Loss of a Child", GRIEF RELATED, guitar, inspiration, loss, lovesong, lyric development, lyric writing, lyrics, Music, original songs, performing, saying goodbye, separating, singing, songwriting, voice lessons, writing. Bookmark the permalink.